Baillie Lumber Co. leads the way in assisting landowners in New York State manage and harvest their timberland. We realize our success starts in the forest, and at Baillie, our entire approach begins with the landowner’s objectives in mind. We believe a partnership between our professional foresters and the landowner throughout the entire forest management process of planning, timber harvesting and restoration is critical to long term success. Our foresters would be happy to provide you with a no obligation consultation to discuss timber harvesting and your forest management objectives. Oneida, Chenango, Lewis, Madison, Oswego, Herkimer, Otsego, Jefferson, Cayuga, Onondaga, Montgomery and all of the rest of the counties in New York State. Hard Maple, Soft Maple, Cherry, Hickory, Red Oak, White Oak, Ash, Walnut, Birch and Basswood. Baillie offers roadside log scaling, trucking and immediate payment. 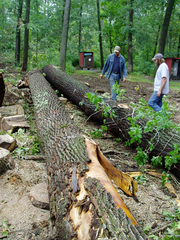 We also accept logs delivered to any of our sawmill locations.